In another sauce pan, mix together the cooked rice (You should have about 1-1/2 cups) with 1-1/2 cups of milk, sugar and salt. Cook this mixture on medium heat until it is nice thick and creamy – about 15 minutes. Cook for a couple minutes longer, stirring constantly. Pour into buttered 1.5 quart baking dish. Bake in slow oven (300F) one hour; stir occasionally. 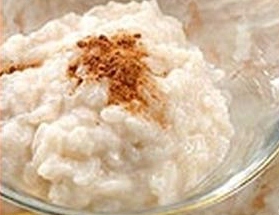 Bake for 2-1/2 to 3 hours or until rice is soft and is surrounded by rich, creamy syrup. It should not bake dry or be underdone. Take one quart milk, half cup rice (boiled), four tablespoons sugar, four eggs; flavour to taste. Put milk and sugar in saucepan and let it come to a boil; then stir in the rice which has been mixed with the beaten yolk; let this boil two or three minutes; beat the whites to a froth; mix with them two tablespoons sugar; place on top of the rice, and put in the oven to brown. In a one quart casserole, blend together sugar, cornstarch and salt. Gradually stir in milk, mixing well. Microwave on high 5 to 7 minutes. Stir every 3 minutes until mixture is smooth, thickened and clear. Stir a small amount of pudding into beaten egg. Return egg mixture to hot pudding. Microwave at medium high for 1 to 3 minutes, stirring after 1 minute until smooth and thick. Add butter, vanilla and rice. In a colander, rinse rice thoroughly under cold water. Put in lightly greased slow cooker. Add remaining ingredients, except for butter & whipping cream. Pour butter over rice mixture. Cover and cook on HIGH for 2 1/2 to 3 hours, until rice has absorbed the liquid.